stationary diffuser vanes surrounding the impeller. The diffuser vanes force a rather radical change in the direction of the impeller discharge, and this, in turn, slows down the discharge. In addition, the diffuser vanes form volutes of their own that further diminish the velocity of the discharge. Finally, the discharge from the diffuser vanes flows along the pump casing which, like the simple volute-type pump, is also in the form of a volute. Thus the diffuser-type pump provides for a nearly complete decrease in velocity and consequently an increase in discharge pressure. The types of centrifugal pumps used for pumping sewage do not use diffuser vanes. The reason for this is that the rapid change in the direction of the impeller discharge can cause suspended matter in the liquid to come out of suspension and form deposits that corrode and foul moving parts. Other types of centrifugal pumps, known as turbine well pumps, are used to pump wells. To produce sufficient discharge pressure, you must equip these pumps with a multistage impeller arrangement that is contained in volutes, referred to as bowls. To ensure satisfactory suction, set the impellers and bowls below the lowest drawdown or pumping level that the water in the well is expected to reach. To pump the general water supply. This includes both the overhead and pneumatic tank systems. In general water supply systems where the pump takes off directly from the city pressure main or where no suction lift is required, a centrifugal pump can be used. When a centrifugal pump is being used with a suction lift of no more than 15 feet is required, a pump with an automatic primer or a suction line equipped with a foot valve may be used. To provide booster service. In booster service, centrifugal pumps with in-take pressures from the city main operate only to boost this pressure. They may run continuously or automatically. When the automatic type is not operating, the water flows by city pressure through the impellers. To pump the domestic water supply. In domestic water supply systems, the centrifugal pump is used in shallow wells (suction lift not over 22 feet), in deep wells (for greater depths than 22 feet), and in a complete pneumatic system with electric motors or gasoline engines. To provide a hot - water circulating service. Hot- water circulating pumps are centrifugal. They move water in a closed system and thus usually require only a low head, though the static pressure in the systems may be high. The pumps should be selected with attenti on to strength of casing, efficient stuffing box, freedom from air and vapor binding, and flexible mounting. float and are available in single or duplextype (fig. 6-17). Figure 6-17. 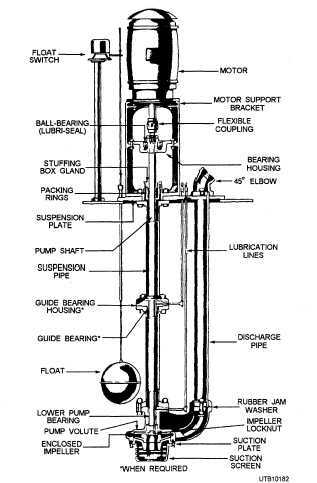 - Vertical submerged-type of centrifugal pump for sewage.